Remember, I write for myself, and for my memories – but do enjoy sharing. Today truly began over 57 years ago – and as I reflect, there are threads that have run through my life since my pre-teens. And, in a simple way, that is what I am made of, and what brings me pleasure. Remember, I introduced BELZEBUTH II aka LADY RAB II on 19 March? Well, an attempt was made on a projected beautiful day, 29 March. But after unpredicted pouring rain from Exit 5 to Exit 3 on I-91, that retrieval mission was scrubbed with tears. 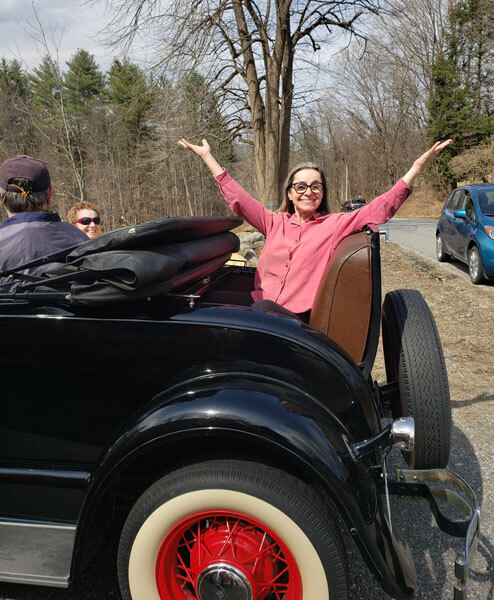 Watching the weather, today, 7 April, was another potentially clear target of opportunity – some sun, 50 degrees plus, and no rain projected – hey, I was driving a 90 year old convertible home (top down always) 85 miles. And, this time it did not rain. 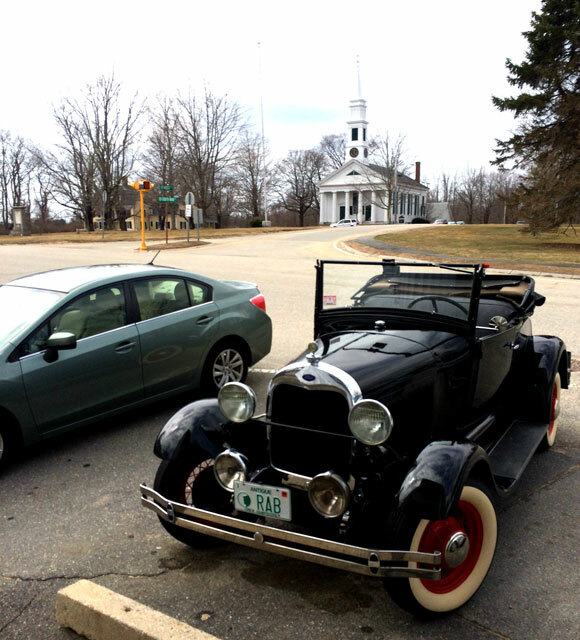 Carolyn graciously picked me up at 8, and we arrived in Charlton, Massachusetts about 10:15 – backroading, of course. 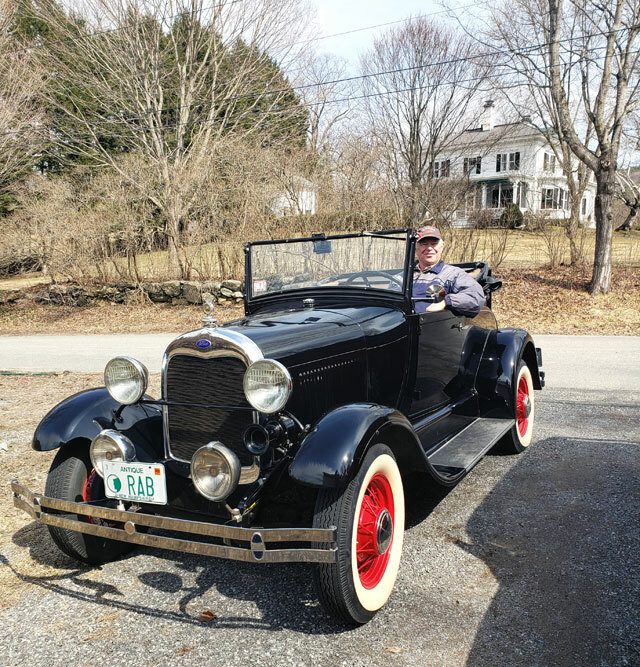 Attached my plates (from my last Model A, sold in September, but I renewed them anyway, something – somebody – told me to do so), chatted with previous owner (know from experience it was hard), and off I went. To put things into perspective, Charlton, Massachusetts is just east of Sturbridge (and OSV that I love) and about 9 miles north of the Connecticut border. Only scheduled stop (and fortunately no unscheduled stops were required) was the Country Store in Petersham for lunch. We arrived on schedule a few minutes before noon. You know I love old county/general stores. Make sure you plan to stop when in the Quabbin area for a bite to eat. 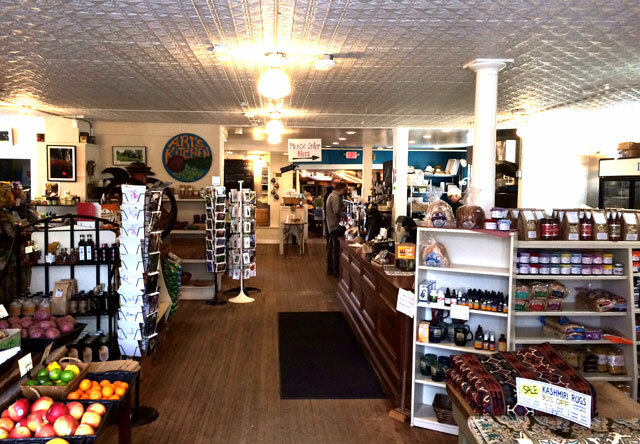 RAY RECOMMENDS – A Visit to the Petersham Country Store. The Common in Petersham is worth a visit. We continued north, leaving about 12:30 following Route 32 crossing the border, through Swanzey, and into Keene, and then north to home. Arriving back home just before two, the first stop was to “show off” at a friend’s house – having just adopted a new dog, she could not travel on this trip – priorities! and, then tucked in with her new “siblings” – never, never to leave again !!! Trivia History Lesson. 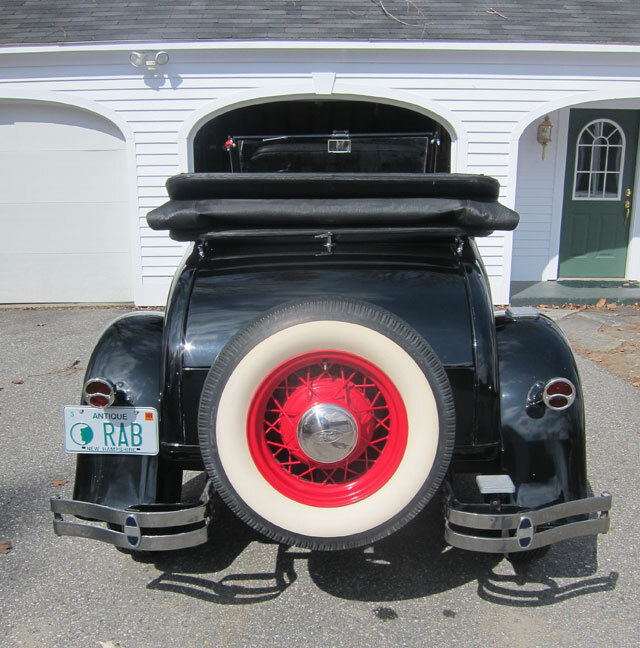 First stop in town to “show off,” T asked, “why is it called a rumble seat?” Sadly, I have never questioned the derivation. 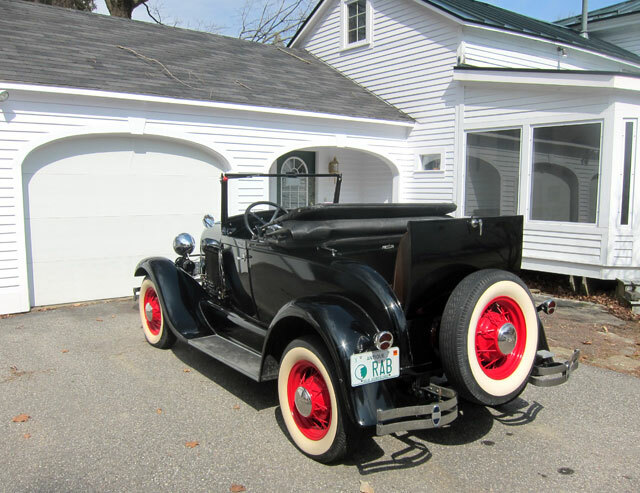 I do know that if you wanted the optional rumble seat in a 1928 or 1929 Model A Ford Roadster (instead of simply a trunk) it cost $35. A single seat in the rear of a vehicle in the early days was called the “mother-in-law” seat. My Dad had two such vehicles, a 1908 Buick and a 1909 Model T Ford, with the single seat in the rear. Well, continue below for some possible explanations. But, first an image of glee and approval, from a rumble seat. 1 – Sir Hubert Malcolm Rhumble, a prominent carriage designer of England’s late 1800s., designed a coachman’s seat that stuck in the car lexicon, according to the Automobilist Magazine in August 1958. 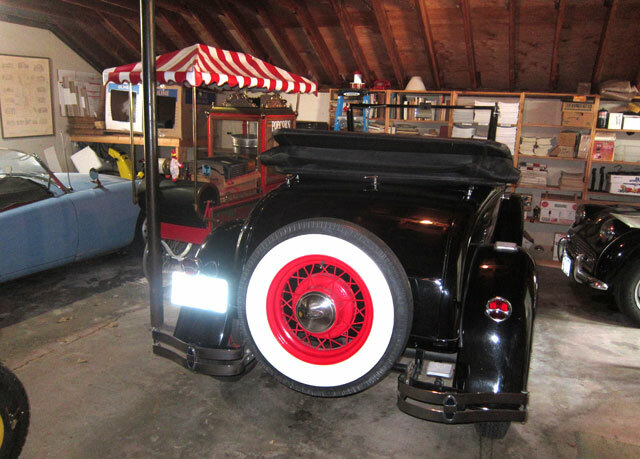 In early vintage automobiles the trunk lid folded back to form a seat area, sometimes called a “mother-in-law” seat. 2 – Early use of “Rumble Seat” referred to the seat behind the body of a carriage on which the servants rode, well before cars existed. The application to cars evolved from the fact that the seat was indeed behind the enclosed portion of the ‘coach’ of the car. With regards to the expression rumble seat itself, perhaps it was due to the ‘rumble’ the carriage made as it travelled, and the open nature of the seat making the occupants more susceptible to the sounds of the rumble? 3 -The rumble seat (or auxiliary seat or ”mother-in-law`s seat”) first appeared on several models at the 1925 auto show in New York. Like the convertible, it swept the country. Everyone was talking about rumble seats. 4 – and, a simple definition – An uncovered passenger seat that opens out from the rear of an automobile. Did I tell you there are “threads through my life?” Printing, stamps, history, shunpiking in my special cars, 19th century general stores, photography, and places that bring me pleasure? Well, in the summer of 1963, high school friends and I painted a barn in Charlton, Massachusetts. One friend’s Dad owned the place as a weekend retreat/investment. We ate breakfast at the HoJos on the Mass Pike, entering from the back entrance off US 20. 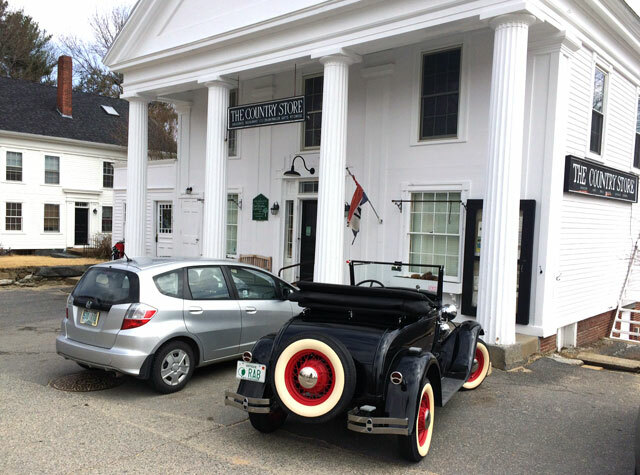 In the evenings we visited the now gone car museum in Sturbridge, and I visited antique shops (see the pattern). Well as I am writing this, to my right on the radiator is the view below. The two toy cars on the left I bought in Charlton, Mass. in 1963, just miles from where my “new” roadster came from. And, see the cast iron fire truck? Cost me $4 at an antique shop in Gaylordsville, Connecticut on a Belzebuth I excursion in 1963. 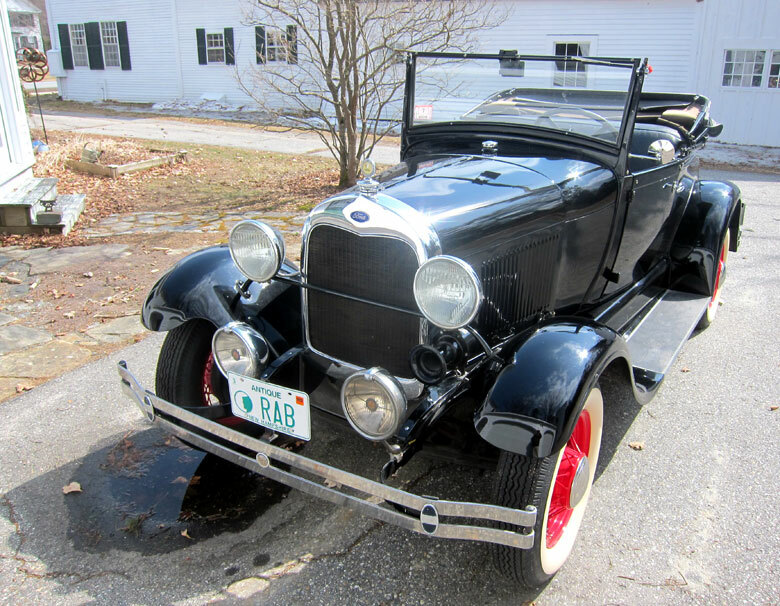 This entry was posted in Miscellaneous Musings and tagged 1929 Model A Ford Roadster, Charlton, Massachusetts, Petersham, Petersham Country Store. Bookmark the permalink. Congratulations! Can’t wait to see it in person. Good on ya friend! What an adventure. So happy that you share your passions with us! Make sure those door handles are on tight! Those cars are superb. Come north one of these days and give us a rumble ride! I can really feel your joy in this post, Ray. Congrats on your new beauty! Love the tie-ins to your past, too.